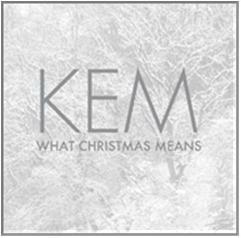 *(Detroit, MI) — Two-time Grammy Award®-nominated Motown artist KEM’s first holiday album, WHAT CHRISTMAS MEANS, is now in stores, and is available at Amazon.com, among other online retailers. 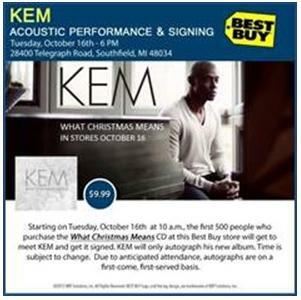 To celebrate the album’s release, KEM will be performing selections from WHAT CHRISTMAS MEANS and will be signing copies of the CD at 6:00pm at the Best Buy store at 28400 Telegraph Road in Southfield, Michigan. The first 500 fans that purchase the CD at that Best Buy location (beginning at 10:00am when the store opens) will get wristbands to attend the performance Tuesday evening. KEM had been giving fans a sneak peek at the 10-song collection of original and cover holiday classics throughout the 10 days leading up to the album’s release. A clip of each song had been posted daily by KEM on his Facebook page (www.facebook.com/KEMofficial), until today, when the album became available in stores. The 10-day countdown began Sunday, with a clip of “Glorify the King,” the first track of the album. The title track, “What Christmas Means” and “A Christmas Song for You” followed on successive days. Since the first post, fans have been clamoring for more music, and consistently say they “can’t wait” for the album’s release in their responses on Facebook. WHAT CHRISTMAS MEANS is the fourth Motown release by lifelong Detroiter, KEM. The 10-song album consists of five original Christmas compositions and five traditional holiday classics. The final sequence for WHAT CHRISTMAS MEANS is as follows: Track 1: Glorify the King – Track 2: What Christmas Means – Track 3: A Christmas Song for You – Track 4: Have Yourself A Merry Little Christmas – Track 5: Christmas Time Is Here – Track 6: The Christmas Song – Track 7: Be Mine for Christmas (feat. Ledisi) – Track 8: Merry Christmas Baby – Track 9: We Three Kings – Track 10: Doo Wop Christmas (That’s What Christmas Is All About). The album is highlighted by a duet with Verve recording artist, Ledisi, on “Be Mine For Christmas,” co-written by KEM and new collaborator Melanie Rutherford. The album also includes orchestra arrangements by Motown legend, Paul Reiser. KEM played his most recent sold-out headlining Intimacy Tour of the U.S. with special guests Musiq Soulchild and Ledisi. Earlier this year, KEM made his second trip to South Africa, his biggest international territory outside the U.S., for a pair of sold-out concerts at Standard Bank Arena in Johannesburg. While visiting, he was presented with gold record plaques by Universal Music South Africa for his first two Motown albums, KEMISTRY (released 2002) and ALBUM II (2005). Also this year, KEM made his big-screen debut in the movie, SPARKLE, starring Jordin Sparks and the late Whitney Houston. 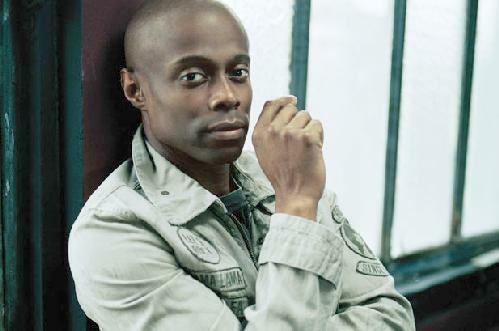 After KEM’s indie debut album, KEMISTRY, sold nearly 15,000 copies, he was signed to Universal Motown, who re-released the album and saw it rise to #14 on the Billboard Top R&B Albums chart in 2003. In 2005, KEM previewed music from ALBUM II on a 20-city underground tour, and the album hit RIAA gold sales within two weeks of its release. ALBUM II peaked at #1 R&B/ #5 pop, and one of its tracks, KEM’s original “I Can’t Stop Loving You,” won the 2005 Billboard Music Award for Top Adult R&B Single of the Year. INTIMACY: ALBUM III, which debuted at #2 Soundscan in August 2010, went on to garner national critical and commercial acclaim, including two Grammy Award® nominations, a Soul Train award nomination, and a BET Centric Award nomination. KEMISTRY, ALBUM II, and INTIMACY: ALBUM III have each been certified RIAA gold, and worldwide sales are in excess of 2.2 million copies.